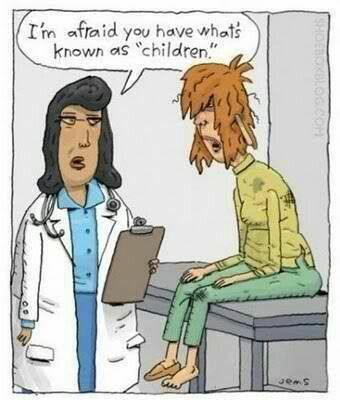 This cartoon made me laugh out loud because that lady on the table looks like I feel most days! Are you a mom? Are you busy? I mean seriously hectic, running in multiple directions at all times? Do you double and triple book yourself, rarely shave your legs, put your make-up on in the car at stop-lights, consider taste-testing at Costco to be a decent meal and grab mismatched shoes as you run out the door? If you can answer yes to any or all of these questions, then this post is for you…that is if you have time to read it. When my son Billy was born, I had 6 other children at home ranging in age from 6 to 16. By the time he was 3, we had kids in 5 different schools including pre-school, elementary, junior high, high school and college. I barely kept it all together. Back-to-school nights, parent-teacher conferences, show choir performances, cross country practices/meets, band performances, piano lessons, orthodontist, eye, dental and doctor appointments, IEP meetings, church activities, Scouts, dances, room mom responsibilities and on it went. Trying to manage this entire family called for extreme measures at times. As I brushed my teeth in the shower yesterday, it occurred to me there are countless time-saving and/or hilarious practices moms implement in order to survive each day of their crazy existence. I thought it would be fun to share a few of my most proud moments and ask you to do the same. My funniest memory is nursing Billy in various situations and locations. I’m not the natural type who will nurse anywhere freely. These were desperate times that called for desperate measures…and, since no-one knew, I was good right? Here’s how it’s done: place baby side-ways across your chest; blanket over baby and tucked under your arm – do not throw it over your shoulder as this is a dead give-away – once baby is finished you discreetly rearrange yourself, peek in as if he’s been sleeping the entire time and the deception is complete. Once I did this on a bench in front of Big-O-Tires, another time delivering flyers to neighbors (after dark), at a scout activity in a park (after pumping 2 days to avoid it), while cooking dinner (I don’t recommend this for multiple reasons, not the least of which is the possibility of burning your baby’s bum, gravity-inflicted pain to yourself or splattering food on your nice baby sling) and at the movie theater (at least it was dark there too). I always wanted my kids to feel like I cared so I put pressure on myself to attend these school events, but it didn’t always happen. In fact, my son Billy is so used to me not going that when I try to, he tells me not to worry. Kind of tough to remember to go if you don’t read the email reminders the school sends out. I must say that if your child is in elementary school though, it’s nice to hit at least one of these per year. You get to look at all the crafts and pictures they made, sit at their desk, write them a little note and take some photos. Priceless. Middle and high school are a bit different though. My teens always tried to talk me out of going: “oh no mom, you really don’t need to go; it’s fine, my grades are good; none of my friends’ parents go”…Just to drive them crazy, I would have my pleading teen draw me a map of their schedule and off I went. Walking in to meet the teacher, I always wondered if it was safe to admit which child was mine. I’m sure most of you actually attend these events regularly. If you don’t, remember not to feel bad because your kids will be relieved. Besides, you can always email the teacher if you have concerns. I don’t need to tell you that getting dinner on the table is never easy. My plan is to serve a nutritious meal, sitting around the table talking about the day. Yeah right. First of all, I can barely drag myself back into the kitchen after the nightmare of homework. Seriously, it takes the stamina and tenacity of a gladiator. Some women plan meal calendars for a month in advance. I can’t even plan one day in advance without forgetting 2 things and double-booking 3 others. I know women who start dinner at 2pm to simplify the afternoon rush. For me, that’s just not possible, although a great idea. After running kids to school, cleaning, doing laundry, errands, yard work or going for a walk, I need to rest a little before the afternoon rush. I try to do my best and no matter what ends up on the table, my family seems to be grateful for food, any food. Just do your best and forget the rest! Note: I found the cartoon above on Pinterest but it had no information on the artist. So nice to see you again … ! Thanks for your kind words. Glad you liked the post! It sure was fun seeing you the other day. And loving your sister is my pleasure! Thanks Danae!